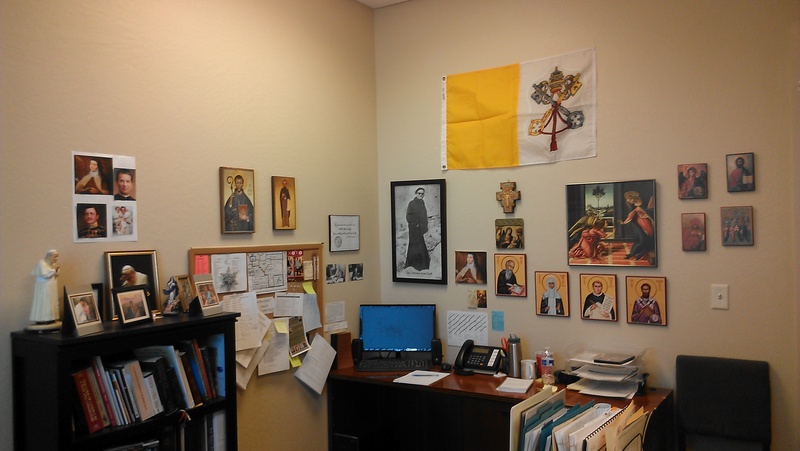 Below are pictures of my Catholic Corner Office at Saint Mary Magdalene Catholic Church. Once we are in the new building, I will have my own office and will post those pictures as well. I love working at Saint Mary Magdalene because I can be the on-fire, papist loving, unapologetic, evangelical Catholic that I am. See my blog post from last year – Characteristics of a Papist. 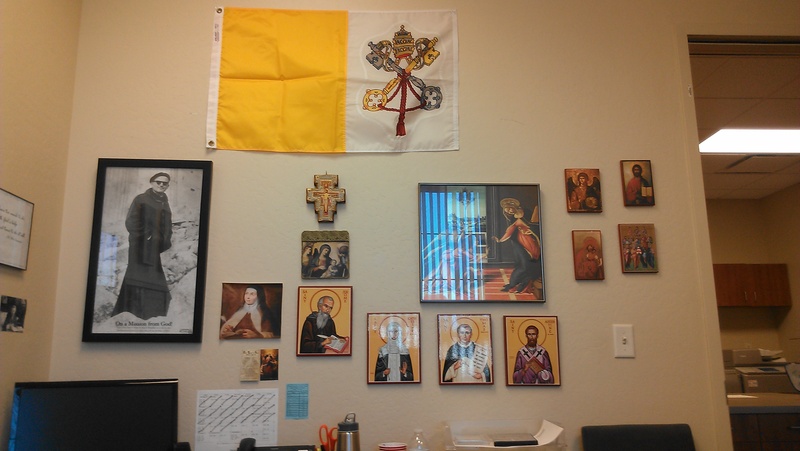 Today, as I put my Papal Flag, my office mate, Gretchen said, “It looks like a dorm room.” My office keeps me focused where my mind and heart needs to be when I am at work. When I was a high school theology teacher, my classroom looked very similar. Just ask any of my former students from St. Mary’s Catholic High School or St. Dominic Savio Catholic High School. This is not Original Sin Pride (Adam and Eve’s sin is rooted in pride), but it’s the love of knowing that Jesus Christ, the Bridegroom, founded the Catholic Church, the Bride, upon Saint Peter in and around 33 A.D. It’s knowing that the Blessed Virgin Mary assumed into Heaven and is the Immaculate, Perpetual, Advocating, Mother of God of all humanity. It’s realizing that my fellow brothers and sisters over the centuries, the Saints, are in Heaven interceding and praying for us as we pray for each other this side of Heaven. Papal Flag, JP2 picture, San Damiano Cross, Annunciation painting, the Blessed Virgin Mary, Icons of the Saints. 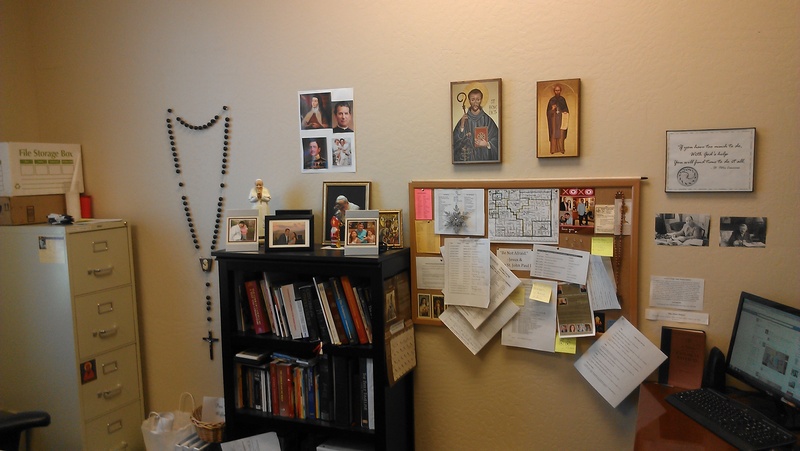 Wall rosary, St. Benedict icons, yes, that’s a mini statue of JP2, B/W of G.K.Chesterton, B/W of C.S. Lewis, pictures of my favorite girls, a full bookcase and my bulletin board.